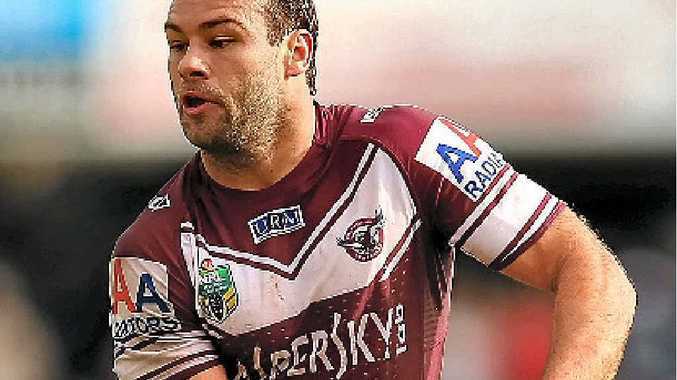 MANLY fullback Brett Stewart sent a timely reminder to NSW Origin coach Laurie Daley yesterday with four try assists in his side's 24-4 win over Cronulla on a soggy Brookvale Oval. The Sea Eagles raced to a 20-0 half time lead, and it took until the last minute of the game before Cronulla found a way through the defence with forward Wade Graham scoring just seconds before the full-time siren. Powerful winger Jorge Taufua, back after missing five weeks with a shoulder injury, ran for 120m, scored a try and set up another in a dominant first half in front of almost 10,000 who braved the miserable weather. Centre Steve Matai scored a double, taking his tally for the season to seven, and prop Brenton Lawrence notched his first for Manly since switching from the Gold Coast last year, courtesy of a hopeful Stewart (pictured) flick pass. The conditions made the second half a slog with Cronulla never looking like mounting a comeback.